Howards Way was my original concept and story. Having owned and sailed boats from my trot moorings on the River Hamble I conceived the concept of a family running a boatyard and 'gave' the idea to a producer I had often worked with at the BBC. Details were altered and very sadly because of other commitments in the Netherlands, I was unable to direct the first series. 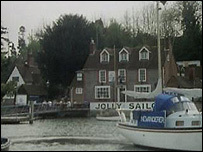 It was delightful and somewhat odd to end up directing episodes using the Jolly Sailor as a film location. He got a love of boats from being in Howards Way and sailed with me several times. Chris was instrumental in putting together the exciting power boat race on Southampton Water asking many of his customers to bring their boats to race round the buoys and be part of the crowd at the Prize Giving staged in my sailing club at Warsash. These are the 'new' end credits I directed and created with the aid of Chris Colman driving the fast boats and Barracuda being sailed by her racing crew with a brilliant helicopter pilot making the aerial shots from my storyboard. In the end the series became more about 'black bed sheets' than about boats!